Psychology professor Shelly Grabe’s study focused on how land ownership among Maasai women in Tanzania influenced the dynamics of relational power and individual agency that enabled political participation. Photo by Shelly Grabe. 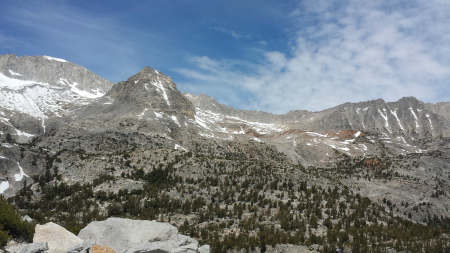 Environmental Studies professor Michael Loik examined soil moisture, plant water content, and photosynthesis at different elevation gradients near Mammoth Lakes, CA. Photo by Michael Loik. Pictured here are the slopes of the quartzite outcrop that anthropologist Jay Reti studies. 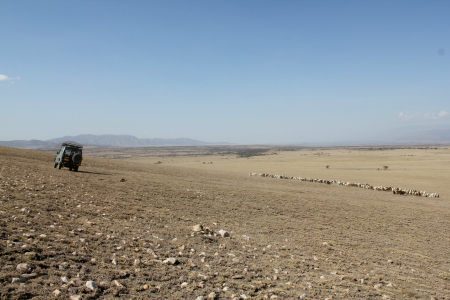 The area is known to the Maasai in Tanzania as Naibor Soit ("white mountain"). Reti found that rocks available at this location would have been available to hominins 1.8 million years ago, but would have required a 3-5 kilometer walk to transport them across the landscape. Photo by Jay Reti. Here are just some of what social sciences faculty and researchers published in winter quarter, 2016. Blackmore also published a piece with Anthropology Laboratory Manager Richard Baldwin that examined the challenges Lesbian, Gay, Bisexual, Transgender/Transsexual, Queer, and Intersex archaeologists face in fieldwork. They offer personal narratives about the unique, intense and intimate conditions of fieldwork, and the biases and harassment queer people too often face. They outline a number of practices that project directors and others can do to make fieldwork a more inclusive and a safe space, such as examining privilege, ensuring housing preferences are met, and being aware of laws and social norms related to gender and sexuality in different geographic areas. Only by actively addressing these issues and being willing to learn can an environment and discipline be created that "actually reflects the diversity and breadth of the human experience. What can different rock flakes tell us about the economy 1.5 - 2.5 million years ago in Tanzania? Quite a lot, according to Research Associate Jay Reti, who statistically quantified and analyzed Oldowan stone tool production. Reti found that early humans selected specific raw materials for tools at one site and transported only high-quality materials to their destination - a method that suggests an economic system and understanding among early humans to increase efficiency in manufacturing and to mitigate production and transportation costs of stone tools. Entrepreneurs are often touted as being essential for job creation. So what influences a startup’s decision to hire their first employee? Professor and Chair of Economics, Robert Fairlie tracked down unique and hard-to-find data to learn more about the entrepreneurs who take the leap to become employers. Fairlie discovered that successful startups typically hire within 3 years of existence. He also noticed that revenue levels are not strong predictors but business assets and intellectual property are. Other positive indicators include work experience and business assets. Fairlie also found evidence of a gender divide in job creation among startups: female-owned businesses are 10 percentage points less likely than their male counterparts to hire their first employee. Most online ad space is allocated through an automated auction to determine which ads go where. Two popular auction formats dominate: Vickrey-Clarke-Groves (VCG) is used by Facebook and Generalized Second Price (GSP) by Google. Distinguished professor Dan Friedman and alum Kevin McLaughlin (UCSC Economics Ph.D., '15) asked which format is more efficient and which captures the most revenue for platform owners. They conducted a series of bidding experiments at the LEEPS lab and found that revenue capture was close in both formats. However, they discovered that VCG is generally more efficient and therefore a better choice for a new platform. Associate Professor Michael Loik and undergraduate Charlotte Reed ('15)studied the effects of the recent drought and precipitation differences on one of the most widespread evergreen shrub species in the United States. In an incredible undergraduate opportunity to participate in field research with faculty – Loik and Reed experimented with water availability to examine soil moisture, plant water content, and photosynthesis at different elevation gradients near Mammoth Lakes, CA. They found that at lower elevations, shrubs were drier, sequestered less carbon, and were more likely to burn in a fire. Charlotte Reed, now in a Ph.D. program at the University of Montana, received the Chancellor's Award for Undergraduate Research award, the Dean’s Undergraduate award, and the Environmental Studies award for the study. For International Women’s Day, Assistant Professor Sylvanna Falcón was interviewed for the University of Washington Press blog about her upcoming book, Power Interrupted: Antiracist and Feminist Activism inside the United Nations. Falcón shared what inspired her to write about feminist human rights work at the United Nations. She also talked about the challenges she faced writing a historical analysis of a large institution. The book will be published in April. 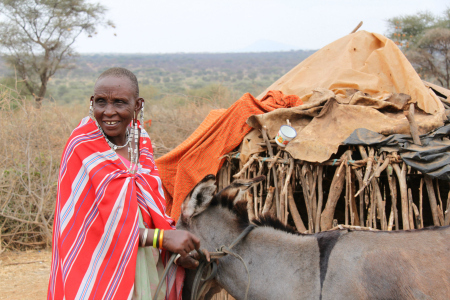 Associate Professor Shelly Grabe examined how structure, power, and agency can enable or limit women’s political participation among Maasai women in Tanzania. Grabe discovered that when women have access to structural resources such as land ownership, they gain power within their marital relationships and are more likely to become engaged in political participation and decisionmaking. Phillip Hammack, an associate professor of psychology and Andrew Pilecki, a graduate of the department's Ph.D. program, published an op-ed, Going the distance: contact vs. motivation, arguing that well-intentioned programs that promote contact to reduce prejudice are, at best, inconsequential, and at worst, harmful. Professor and Psychology Department Chair Campbell Leaper and graduate student Timea Farkaspublished a research study on adolescent girls’ and boys’ endorsement of paternalistic attitudes in relation to their conceptions of their future selves in work and family. Paternalism refers the belief that women need to be protected by men. Leaper and Farkas found that these attitudes were related to greater likelihood of aspirations for future business/law and action-oriented careers among boys, aesthetic/arts-oriented careers among girls, and strong family expectations among both girls and boys; conversely, girls with paternalistic attitudes were less likely to express interest in science careers. Leaper and Farkas also wrote a chapter about the psychology of boys for the American Psychological Association’s Handbook of Men and Masculinities. They considered how variations in the social-psychological development of boys may be related to gender socialization pressures as well as boys’ internalization of traditional notions of masculinity. For example, they address how extremes concerns with traditional masculinity may undermine boys’ academic achievement and intimate relationships. Leaper and Farkas also explore how traditional masculinity can lead to sexist and heterosexist attitudes that negatively affect girls as well as nontraditional boys. What can we learn from how Indigenous communities teach their children? In a volume co-edited by Professor Barbara Rogoff, she and two former Ph.D. students, Maricela Correa-Chávez and Rebeca Mejía-Arauz, explored how children learn by being involved in the everyday activities of their families and communities. They focused on indigenous and indigenous-heritage communities of the Americas and how these communities teach values of "considerateness and awareness of how one's actions impact others" that lead to effective collaboration. The work is interdisciplinary, combining the approaches of psychology, anthropology, education, linguistics, and history. Teaching increasingly relies on electronic screens like tablets and less on paper and objects. But does that help or hinder learning? Associate Professor Travis Seymour and graduate students Sara Goodman and Barrett Anderson studied the costs and benefits of students using digital devices versus traditional physical objects to learn spatial and math skills. Their study determined that students performed better with a physical, manipulative task over its digital counterpart. They also discovered the difference can be completely mitigated by starting students on the physical version and then moving to the digital one. More than half the world's population now live in cities. Some scholars and planners have long considered environments as city versus nature, urban versus rural, or similar binaries that define how society interacts with different areas. More recently, hybrids of these binaries have emerged, which Assistant Professor Hillary Angelo argued are an increasingly poor fit for modern urban environments - especially when confronting signs of "not-city" in urban environments. Instead, she calls for studying these "ways of seeing" as we strive to move beyond them. How can community-based organizations promote a culture of engagement and health in marginalized populations? Associate Professor Veronica Terriquez shows how community-based organizations play an important role in maintaining a culture of health and engagement for marginalized populations that are most at risk for poor health. This paper is part of her ongoing research on youth civic engagement in thirteen low-income urban and semi-rural California communities involved in the Building Healthy Communities Initiative. Groundwater is a critical and major part of California's fresh water supply, but is it being managed sustainably? Associate Researcher Ruth Langridge led a study commissioned by the State Water Resources Board and found that court adjudication often focuses more on resolving conflicts over use of groundwater basins than sustainable management. The study and its recommendations for sustainable practices will be important as the state water board develop groundwater management plans. UCSC graduate students Abigail Brown and Kirsten Rudestam assisted. A journal article about the research is in press, and Rudestam will present about the topic at the upcoming American Association of Geographers meeting.